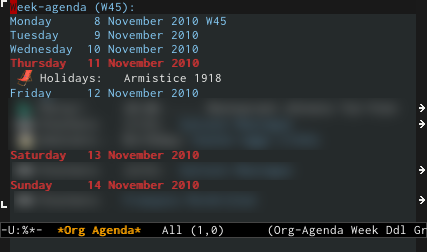 Org-mode has a nice option which allows you to show week-end days in a different color in your agenda. That means that Saturday and Sunday (when I do not work) are fontified with org-agenda-date-weekend. But there are other days I do not work, like my vacations or holidays. Therefore, I've wrote a patch to add org-agenda-day-face-function which is optionally called to determine what should be the face used to fontify a day. This allows me to use the same face for holidays and for week-end days, like for last Thursday which was an holiday in France. That patch has been merged in Org last week.